When it comes to having a lot of time on your hands, not many can compare to Fernando (Sheepo) who occupies himself by building some of the most interesting Lego vehicles. Fernando doesn’t just build small-scale Lego cars, this guy takes his builds to the next level by turning them into fully functional remote control Lego cars and trucks. 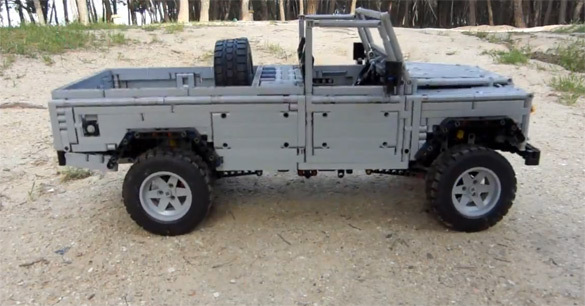 One of his latest projects, a Land Rover Defender 110, is probably the most amazing Lego creation I have ever seen on a small scale. For Fernando, the Land Rover is a supercar, as he explains on his Sheepo’s Garage blog. The Lego truck, among his other projects, is built from original Legos but has a fully functional radio control system with gears, disc brakes and a running engine to boot. I welcome you to check out Fernando’s site where he posts about other Lego vehicles he has constructed such as a Porsche 911 Cab, Mini Cooper, Dodge Viper and Bugatti Veyron. His attention to detail in the realm of what you can do with Legos is simply astonishing. He has even entered the vehicles into competitions and of course walked away with a victory. Hit up the videos below to see some of his latest projects in action for yourself.